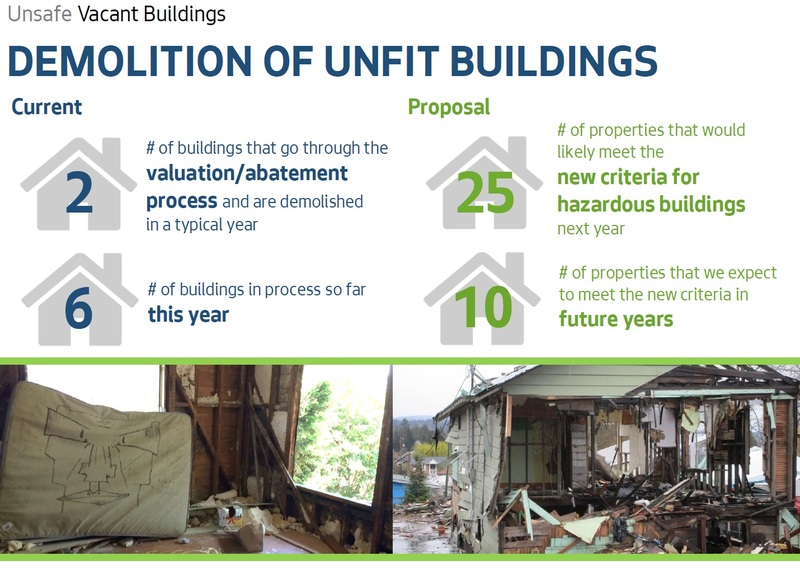 This morning, the Council heard a proposal to tighten the rules and streamline others in order to prevent vacant buildings from becoming neighborhood nuisances — or worse, fire hazards. Faith Lumsden and Christina Ghan from the Department of Construction and Inspections (SDCI) joined with Seattle fire Chief Harrold Skoggins to pitch an ordinance that would prevent many vacant residential buildings from falling into disrepair, and expedite the process for demolishing others. Lumsden presented some statistics about vacant homes in the city — and the substantial increase in complaints over the last four years. Last year the city received complaints on 377 vacant properties across the city related to squatters, potential criminal activity, garbage and other blight or nuisance issues. SDCI only has one and a half inspectors for vacant buildings, so it can’t proactively patrol the city for them; rather, its work is complaint-driven. When it receives a complaint, if it can contact the owner and get them to board up the building within 24 to 48 hours, then they follow that path. Otherwise, SDCI issues an “emergency order” that allows the department to board it up itself. 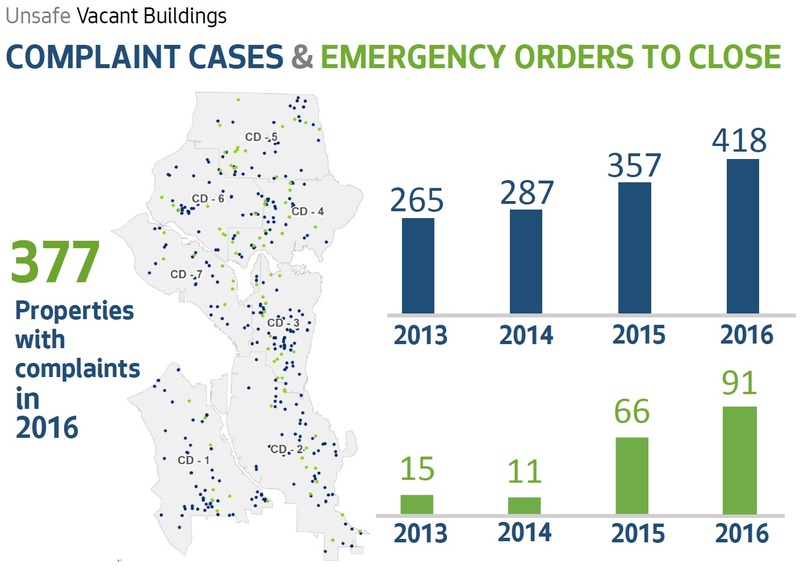 Last year, the city received 418 complaints (some properties had more than one incident during the year) and 91 of them resulted in emergency orders. Skoggins explained that buildings that are left vacant and unmaintained begin to deteriorate, and the walls, ceilings and floors that normally confine a fire to a small space fail to serve that purpose anymore so fires spread more quickly and become much more dangerous. Deteriorating structures also make it increasingly unsafe for fire fighters to enter and move through the building to put out a fire. SFD has recently changed its processes related to vacant buildings, so that whenever they are called out to a vacant building site they add to their own database documentation on the structure so that when they inevitably get called back there for another incident their staff know what they are getting into and “it becomes a defensive operation instead of an offensive operation.” SFD has responded to 47 fires in vacant buildings since January of 2015. It increases the standard for securing windows and doors in vacant buildings, requiring thicker plywood or alternative materials such as clearboard, and it requires using screws instead of nails to make them harder for squatters to remove. It clarifies the authority of the city to go into a site and clean up junk and garbage. There is a process for the Director of SDCI to order an owner to demolish a building that has been deemed unfit for habitation. But it’s a long process, requiring a cost evaluation of repairing it vs. replacing it, a hearing, and then a ruling by the Director. All that can take a couple of months. The bill proposes an alternative pathway for some buildings that have been entered by the police or SFD who can attest to the condition of the building and the health and safety issues. That would allow the city to order demolition soon than today. Owners would still be able to appeal the ruling to the Hearing Examiner. 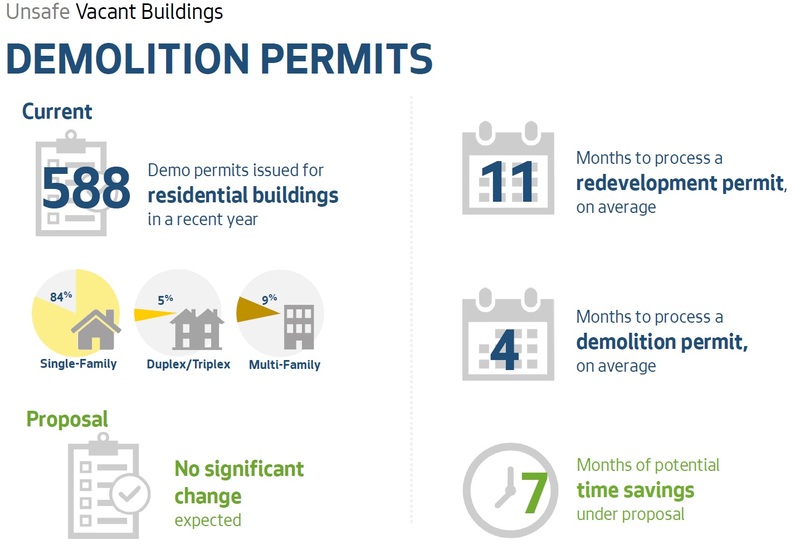 In past years, SDCI averaged about two demolitions ordered per year. In 2017, to-date they have already done six. They have a current backlog of several dozen buildings that they believe will meet that criteria, and once the backlog is gone, they expect about ten per year. Demolition of housing in multifamily and commercial zones. the property becomes unfit for habitation and SDCI issues a demolition order. Under the new proposal, the 12-month limit is reduced to four months. That will allow for demolition well in advance of the new construction. There will be more vacant lots around the city, at least temporarily, but that is better than hazardous vacant structures. The Council members responded very favorably to these proposals. In fact, most of their comments were related to adjacent issues. Council member Gonzalez was concerned that the complaint process is not as accessible to underserved communities; she asked for a Racial Equity Toolkit analysis to be done on the program, and that SDCI look for ways to increase its outreach to those communities so that they know that enforcing the laws on vacant properties is a service the city government provides. Council member Juarez raised concerns about vacant motel properties that create a special kind of nuisance in neighborhoods, especially along Aurora Avenue. Both Gonzalez and Juarez wanted to look more at alignment between the “nuisance property” laws already on in place that are aimed primarily at commercial properties, and SDCI’s proposed new bill which mostly targets residential properties. This morning’s discussion was the first for the Council on the bill. Committee chair Rob Johnson announced that there would be a public hearing on the bill on June 20th, with Council action to follow. Here’s SDCI’s full writeup of their proposed ordinance. FYI, here is SDCI’s page with information on how to register a complaint about a vacant building.